My granddaughter Anna shows me her “homework” and fluently reads from a text. Her father, who takes almost everything, including the achievements of his children, in stride, remarks that he doesn’t remember spelling words like Antarctica and penguin in first grade. Anna’s in the top level of her reading class at an average school. I say, that although I taught high school English for a few years, I never had a good sense of elementary curriculum. We agree we are mildly impressed with her reading ability. I know that reading is key to success and will serve her well, particularly in school. If she has reading skills now, academic success is one challenge we likely don’t need to worry about. I think again, and tell Anna’s father, that what I really wish for Anna, who tends to perfectionism, is that reading will become a sanctuary for her, a way to calm herself. Just because she can decode easily doesn’t mean she’s learned to use reading the way I have, and I suspect most book lovers have – as a place to go and not think about our flaws and failures. Reading is not just an escape, though it can be that. It has served me as a way to shut out annoyances as well as what counselor types refer to as negative self-talk. As a child I was able to create that bubble of attention while reading a book– seemingly not hearing the requests – come to the supper table -- or seeing the chaos – my brothers’ squabbling -- around me. Rejected by playmates, stung by slights and cruelties, I didn’t stew for long; I could always read. That place of sustained attention and focus on another, often imaginary, other is just a leap short of a kind of stillness I find in more meditative activities. Reading slows my mind. Books are hypnotic places of sanctuary. Granted, sometimes what I read quickens my heart beat, irritates me, scares the bejezus out of me – or lingers as malaise over the state of the world, but these are moods and malaises I can mull and get over, and ones that are outside myself. As I read blogs about depression, plagiarism and feeling overwhelmed, I think about the healing power of reading. Reading, writing and sharing reading experiences in blogs and otherwise can be ways of presenting false personae, but they also can be ways of exploring and expressing authentic selves. If I had magic wand and could be a fairy godmother/grandmother, I would give the gift of such sustained, focused attention to Anna. I know she will think she's reading primarily to learn for many years to come. She may also discover along the way that reading entertains, provokes, promotes – and serves all kinds of purposes I have appreciated over time. I hope she also discovers the one most precious to me now: how it empowers me to absorb and be absorbed, to simultaneously find myself and lose myself in something other -- and greater -- than myself. "...lingers as malaise over the state of the world, but these are moods and malaises I can mull and get over, and ones that are outside myself." Exactly. And why I keep returning to crime fiction, I think. I've been thinking about this a lot lately, but I think this helps clarify it. Thanks, Barbara. Not that your posts aren't almost always stunning, but this week they are especially so. Yes! I think it matters less what you read and more how you read it. Crime fiction certainly sweeps us into its world. For me, it often does it faster than just about anything else. I'm in need of a dip back into it soon. Beautiful, Barbara. . . . Something I really needed to read today. Many thanks. Deb -- drawing can be another way to get here -- though probably not for someone just taking it up. Beginning or beginning again anything takes a lot of a different, more erratic kind of thinking. "Reading is not just an escape, it is a sanctuary" ... I love the image that comes to mind as I read that... and I agree whole-heartedly! 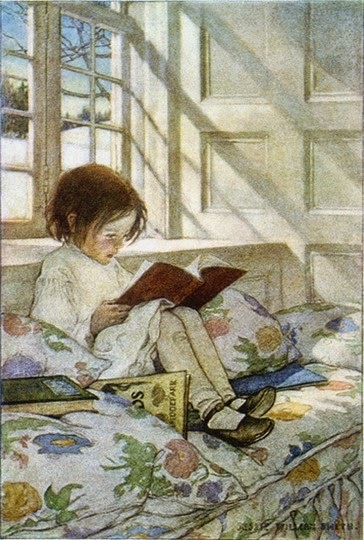 I looked at some pictures of girls reading in search of an illustration--and so many are in peaceful settings. Even the ones that are not -- have a kind of peace to them. Absolutely lovely. Thank you for this. I love the idea of reading as sanctuary, and I know that place of escape was what served me well in my childhood and young adult years. Now I read to explore, as well as escape. To discover new authors and new voices. I will say I have less need for calm and all that I do for meditation -- yoga etc. than when I was busy and had little time for myself, but I still love being absorbed. You’ve perfectly captured my experiences with reading throughout my life. Growing up an only child in the 1960’s, reading was the way I learned about the world and became acquainted with other people. My books and the characters in them were my friends and my extended family. I learned to focus on reading in a day when there was no internet or television to distract me, and it’s served me well all my life as a means of entertainment and solace. I’m happy to say my young grandson has loved books since he was born, and his parents do everything possible to encourage that. I hope he retains it all his life! We had television as well as severe restrictions on watching it. My dad used to take the tubes out of the back of the television when he and my mother went out weeknights if they left my older brother and I to babysit. My sentiments too, about the power of books and reading. I will have to try audio books this year to see if they have the same impact. They are wonderful for long drives, but for me they are harder to follow if there are any potential distractions when you sit at home listening. Good before sleep. Beautiful post, Barbara. My daughter is also Anna, and after 18 years of watching me read, she has grown into the kind of reader we are. Your Anna will too, I suspect.